Delawana Resort is now gearing up for the 2016 season. We are looking forward to welcoming the warmer weather and enjoying the beautiful resort property on Georgian Bay with our guests. We have started taking reservations for the season, and you will now be able to reserve your Muskoka Cottage, Suite, or Room online through our website. Enjoy the peaceful waterfront lakeside cottage getaway in Muskoka, Ontario before the busy summer season begins. Take advantage of our 2 night minimums for cottage rentals in the off-season. Our fantastic off-season rates starting at $125 a night, or $500 weekly will be sure to make your Spring vacation more affordable. Boat docking and trailer parking is included in the off-seasons. 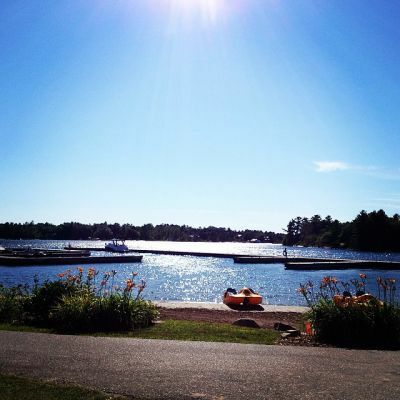 Included in your Muskoka rental as always are: canoes, kayaks, paddleboats, mountain bikes, tennis, basketball, playgroud, lawn games, and sandy swimming beach. Don't miss out on your perfect self-catered resort destination. The Narrows Grill with also be opening its doors on May 20th to bring in the 2016 season with their waterfront views on the resort. The Narrows Grill will be open weekends only until June 24th. You will be excited to enjoy their new breakfast menu upon opening.